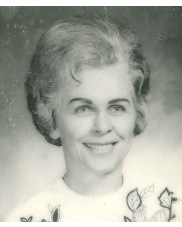 Gerta was born on November 16, 1926 in Witzenhausen Germany to Willi Mueller and Paula Louise (Stormer) Mueller. Gerta married the love of her life Clifton Leo Sigler in November of 1947. To this union Herbert Leo Sigler was born on November 13, 1948. In June 1955, the Army transferred the Sigler family to Ft. Sill, OK. Gerta and the family moved to Duncan, Oklahoma in 1957 then to Comanche, Oklahoma in 1964. Gerta worked for 30 years as a nurse’s assistant at Duncan Regional Hospital in the ICU. She made many friends at DRH, as well as many admirers for her hard work and diligence.